No More Diapers For Us! We finally made it! 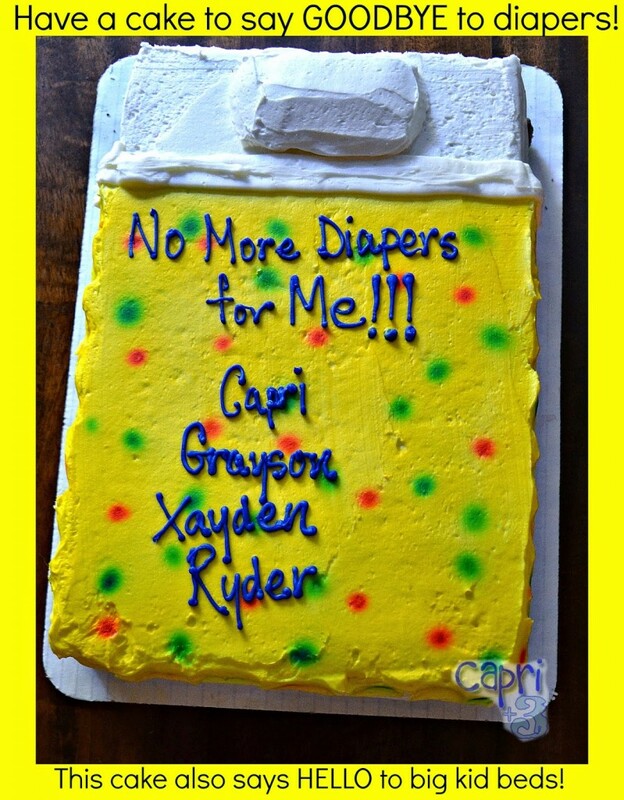 No more diapers. It has been a long journey. I have learned so much along the way. I remember discussing our potty training situation with the Sugarsnaps’ pediatrician when they turned two. I talked about how we planned on using stickers and an m & m each time one of them had success on the potty. She said that it did not matter what incentive we offered. If they were not developmentally ready, it was not going to happen. 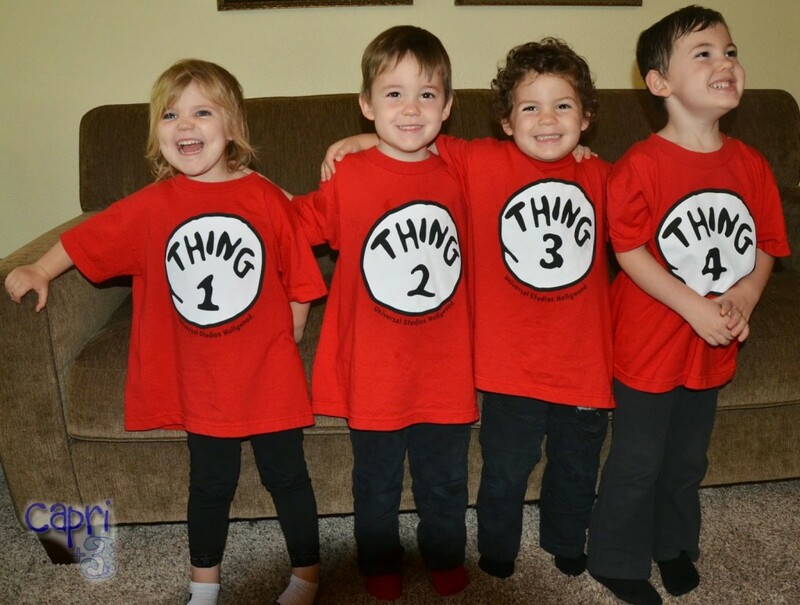 We had times where I was determined to get them all potty trained and puddles pooled on the floor right and left because they were just not ready. I felt frustrated. They felt frustrated. I learned that it was not about me and my timeline. It was about them and their timeline. Just because they are all the same age did not mean they were at the same place developmentally. I had heard so many success stories of children who had a potty buddy and marathon weekend of training and instantly got it. First of all, we simply don’t have enough people to have a potty buddy for each child. Secondly, some were ready and some were not. They happen to be standing in the order that they finished potty training! Capri is very rewards oriented. I can see her striving to get that A on her paper in the future. She figured out the basic math very quickly of how many treats she should receive. “I made pee pee and poo poo. So I get three m & m’s.” She got one for #1 and two for #2. Capri was potty trained shorty after turning two. Grayson was next, also at age two. He is not rewards oriented. He went to the bathroom because he felt the urge to go. He was motivated because he is meticulous and sensory. He did not like the feeling of a wet or dirty diaper. About eight times out of ten he would not ask for a treat because it was not on his mind. 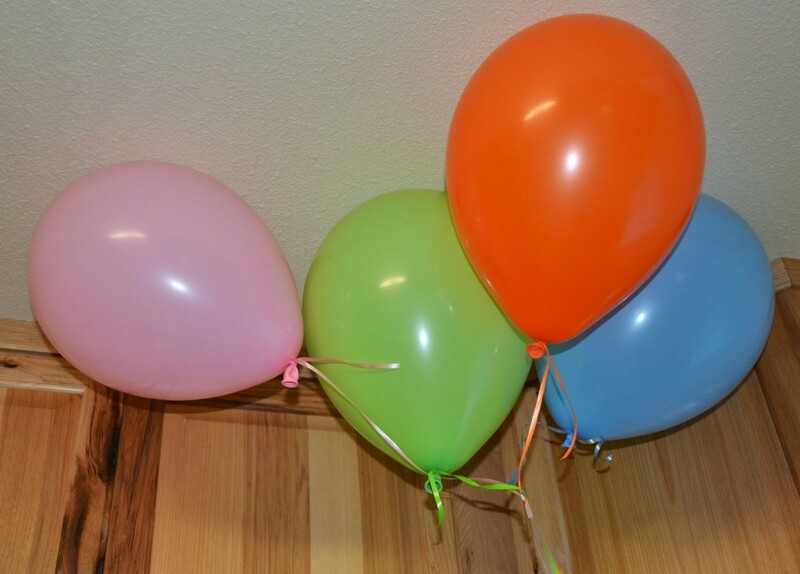 They each had a balloon in their favorite colors. Xayden and Ryder were not making the mind-body connection. They wanted to go in the potty so badly. It brought tears to my eyes when Xayden would sit on the little potty and ask me to hold his hands. He looked at me with big pleading eyes and said, “help me Mama.” He thought there was something I could do to help him have success on the potty. I wished so hard that I could. It broke my heart to see his frustration. The musical diapers we tried helped him to connect the feeling of when he needed to urinate. It took much longer to master #2. Ryder was our last one. He has always had difficulty with motor planning which we found out early on from his Occupational Therapist. But, once he gets something, he really gets it, sometimes surpassing his siblings that acquired the skill sooner. This is our custom cake from the grocery store. We used ‘big kid beds’ as an incentive for potty training. Parents of multiples often use cribs longer than the average parent, in part because each one masters getting out of it at different rates. Ours were able to get out of their cribs safely. Once each one had mastered #2 in the big potty four times, as demonstrated by a big kid bed sticker chart, a new bed was in order. Sometimes along the way, I felt like giving that up because there was such a big gap in completing potty training. But, when Ryder finally made it just before we went away on vacation, seeing his eyes light up with pride to receive his new bed made it all worth it. He got there on his own time and was so proud of his accomplishment. As we had promised, a “Big Kid Bed Party” was in order. Originally, I had planned to make it a big event with lots of friends and family. But, it happened on their timeline which happens to be pretty close to their 4th birthday next month. Since it happened right before vacation, we decided to do it there. We made it super simple with pizza, a big kid bed cake, ice cream and a balloon each in their favorite colors. They were thrilled. It makes me wonder why I had originally planned a big affair. All they needed was some recognition and special treats from the grocery store! We are so happy to have finally reached this milestone. As a psychologist, I am glad it was not easy for us. It gave me a lot of insight about what parents go through in potty training. If the first method had worked, I may have had a false sense of confidence that I trained four with a “great” method. Instead, I learned that potty training is like dieting. Every method works for some people. No method works for all people. Wow! Congrats mommy!!! That's great! Congrats! We're still working on getting our toddler out of diapers. I can't imagine working with four at once. 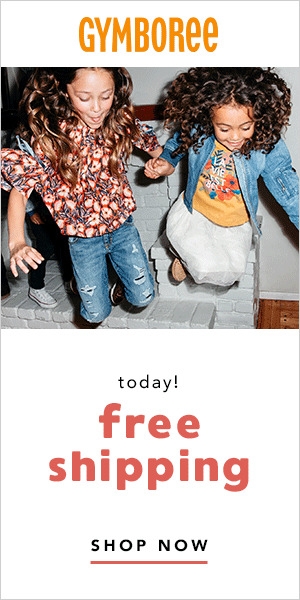 Kudos to you (and the little ones)! Thank you! I can understand that. I do not think anyone wants to prolong diapers! Thank you so much. We are so excited to finally reach this milestone! Thank you. It is a challenge to wave goodbye to diapers. I have decided that parents are often ready way before the kids! I know we were. It is a nice feeling! I will miss lots of things as they grow, but diapers is not one of them. Congratulations! Now you can divert your diaper money to something else. I love when mines got out of diapers. we diverted that money to each on of theirs college fund. It will be a big cost savings for us and will give us time to focus on other things too! Wow Oh WOW! I'm currently in the potty training stage and It's so difficult! I will wait until she shows me that she's ready because like you, I'm so tired of Pee Puddles on the floor! I think most of us, myself included, think we can do it on our timeline at first. Then they show us it's all about them! I think they train us. Congratulations!!! I love your quote about no one method working for all children. Each of my four children potty trained differently, but we are also diaper free, and it is so nice!!! It makes sense looking back on it that every child is different, but there are so many 'fool-proof' methods that it is easy to feel like you, as a parent, are failing when one does not work for your child. Potty training was as educational for me as it was for them! Congrats! 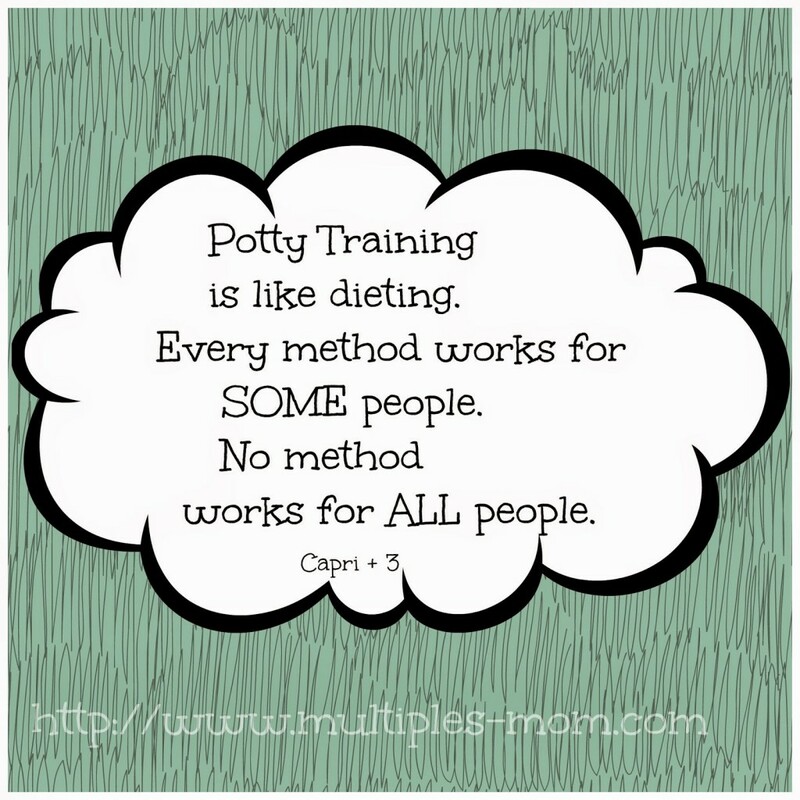 I'm glad you've shared this post as I think it is so important for parents to hear that every child is different and to not feel pressured for their child to potty train at a certain time or in a certain way. Wow, how great this was to read. It's easy to not realise the extra challenges like developmental milestone achievement with multiples. Well done to all four of them. I've just started potty training with miss 22 months. Keeping it casual so far but going well. It's a big job. I hope this post might inspire some parents to take the pressure off of themselves. It is so easy to feel like you, as a parent, are doing something wrong when your child is not potty training in the timeline you imagined. I found some relief from my own pressure, when I realized it was not about my timeline. Thank you. I am glad that things are going well for Miss 22 Months. It is a nice feeling when diapers are done.